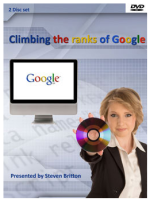 Perfect for beginners, Steven’s DVD introduces some of the basic practices of SEO in an easy to understand, digestible format on his hour-long DVD. He also includes a second disk packed out with resources including free Web CEO Software. Although he claims the DVD is suitable for beginner-to-intermediate level viewers, I would suggest that people already with a sound understanding of optimization may be better off spending there money elsewhere. The introduction to each concept is clear and concise (which is a welcome relief to the “noise” of internet forums and blogs! ), the theory and explanations of the how’s and why’s aren’t as detailed as someone looking to ‘go a step further’ might demand. For a beginner with little or no idea about search optimization, it is a fantastic introduction to ranking higher without waffling on unnecessarily.